Ever since 9/11 America has fought an endless war on terror, seeking enemies everywhere and never promising peace. 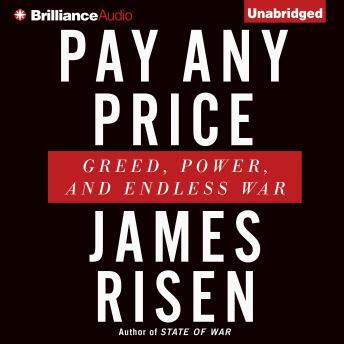 In Pay Any Price, James Risen reveals an extraordinary litany of the hidden costs of that war: from squandered and stolen dollars to outrageous abuses of power to an attack on normalcy, decency, and truth. In the name of fighting terrorism, our government has done things every bit as shameful as its historic wartime abuses — and until this book, it has worked very hard to cover them up. Among the many stunning revelations: • As much as $14 billion in cash was flown to Iraq by the United States government—only to have much of it stolen. Approximately $2 billion of the money was secretly transported out of Iraq in what may be one of the largest robberies in modern history. More than $1 billion of that cash is now sitting in a bunker in Lebanon, beyond our reach despite the fact that we have known about it for years. • The Pentagon tried to set up its own version of the CIA, complete with foreign agents working for cover corporations—only to find itself in bed with questionable Middle Eastern figures, including one who allegedly sought to use a covert Pentagon operation to launder hundreds of millions of dollars. On the side, there were also proposals that could have led to sales of drones to Syria and Lebanon and sales of chemicals that could have been used for explosives to other customers. An internal criminal investigation of the fiasco has been kept secret, until now. • Here at home, when whistleblowers at the National Security Agency tried to protest some of the abuses of domestic surveillance revealed by Risen and, later, in much greater detail, by Edward Snowden, their careers were destroyed, thanks to government persecution.